Once again applying the best techniques of the classic Cold War thriller to the god-awful morass we’re now bogged down in, Seymour (A Line in the Sand, 2000, etc.) follows a hate-seeking human projectile into the heart of the Arabian Desert on his way to a reunion with al Qaeda. Young, intelligent and motivated by a loathing for the West as strong as any native jihadist, the operative known as Abu Khaleb was once a Brit named Caleb. Swept up in an ambush in Afghanistan, Caleb had the presence of mind to latch onto the identity of a cab driver killed in the same raid, an identity he maintained through two years in the Guantanamo prison camp. His apparent innocence and cultural simplicity made him suitable for one of the periodic releases from the camp, an opportunity that gets him out just before repatriation. 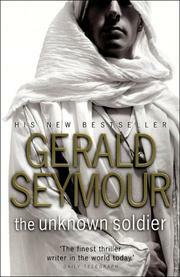 Seymour follows the efforts of American and British human and electronic intelligence gatherers as they begin to understand that the supposedly simple taxi driver is so important to the hunkered-down al Qaeda leadership that they’ll go to any lengths to bring him to their cave in the center of the Saudi wasteland in order to equip him with the filthiest of radioactive weapons. Third-generation British spy Eddie Wroughton works his Riyadh network of informers, including washed-up physician Samuel “Bart” Bartholomew, for scraps of information about Saudi plans and treachery; American Defense Intelligence officer Jed Dietrich, Caleb’s Guantanamo inquisitor, sifts through his own records; and American techies Lizzy Jo and Marty manipulate their pair of armed drone aircraft over endless miles of desert in search of Caleb’s caravan. Professional and national jealousies complicate the work, as does the encounter between the terrorists on their camels and a comely scientist in her Land Rover. Unrushed but thoroughly fascinating look into the making and pursuit of the most frightening kind of terrorist, one of our own.